Simon Reid will make the step up to the British Superstock 600 Championship this season. Young hopeful Simon Reid intends to grasp his chance to shine in the British championship this year after making the switch to the Superstock 600 class. The Banbridge lad, who is the son of former double Formula 2 world champion and Dromara Destroyer Brian, will make the step up after winning the Irish Supertwin title during his rookie season in 2017. Simon Reid with his father Brian at the Dromara Destroyers tribute garden. Picture: Gavan Caldwell. Reid competed in the Ulster Superbike Championship in the Supersport Pro and Cup classes last year and finished third in each, despite suffering an injury setback in the middle part of the season when he sustained a broken collarbone. Riding a Triumph 675 supplied by the Silicone Engineering Racing Team, he won every Supersport Cup race he finished, accumulating 12 victories in all. With his father’s invaluable racing experience to call on, Reid now feels the time is right to kick-start his British championship career and the former Irish, Ulster and British youth motocross champion will race a Silicone Engineering Yamaha R6 in 2019 as he bids to make his mark. 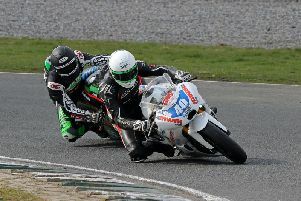 Reid said: “Silicone Engineering Racing provided me with a Triumph 675 that was fantastic to ride. I competed in the USBK Supersport Pro Championship and the USBK Supersport Cup Championship, but it was a difficult rookie year in Supersport as I broke my collarbone mid-season. Looking ahead to a new challenge this year, Reid said he was ‘excited’ to start a new chapter his burgeoning career. “Much as I have loved racing at home, I developed the urge last season to take part in the National Superstock 600cc Championship class at BSB,” he said. “I feel this is the best decision to improve my racing career and I am very excited to begin the new chapter of my racing. 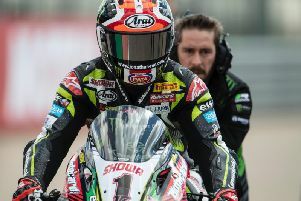 The opening round of the Bennetts British Superbike Championship will take place at Silverstone over the Easter weekend.